Dr. Judith A. Ramaley (pronounced Rah may lee) began her service as the 14th president of Winona State University on July 18, 2005. She was appointed to the WSU position by the Board of Trustees of Minnesota’s State Colleges and Universities (MnSCU) following a national search which concluded in March 2005. Dr. Ramaley replaced Dr. Darrell W. Krueger who had served as WSU’s president for 16 years until his retirement on July 15, 2005. Prior to coming to Minnesota, she held a presidential professorship in biomedical sciences at the University of Maine and was a Fellow of the Margaret Chase Smith Center for Public Policy. She also completed a residency as a Visiting Senior Scientist at the National Academy of Sciences from January to June 2005. Dr. Ramaley has a special interest in higher-education reform and has played a significant role in designing regional alliances to promote educational cooperation. She also has contributed to national discussions about the changing nature of work and the workforce. She also plays a national role in the exploration of civic responsibility and the role of higher education in promoting good citizenship and has published extensively on educational reform, science, technology, engineering and mathematics education and the leadership of organizational change. Under her leadership, The University of Vermont became a member of the Kellogg Commission on the Future of State and Land-Grant Universities that explored the role of research universities in the 21st century. The University established new partnerships in the state that support educational reform, economic and community development, and opportunities for Vermonters across the state. The most significant of these partnerships is the Vermont Public Education Partnership (VPEP) an alliance of the Vermont Department of Education, the University of Vermont and the Vermont State Colleges to promote preK-20 collaboration throughout the state. In Vermont, Dr. Ramaley was a Director of the Vermont Business Roundtable, a member of the Human Resources Investment Council (HRIC), a member of the Vermont Commission on Higher Education Funding, a member of the Governor’s Council of Economic Advisors, a member of the Vermont Quality Council Board of Advisors and Co-Chair of the Vermont Campus Compact. At the national level, Dr. Ramaley serves as a member of the Girl Scouts of the USA Board of Directors, a member of the National Governor’s Association Innovation Task Force, and a member of the National Science Resource Council (NSRC). She has also served as a member of the board of the Association of American Colleges and Universities (AAC&U), as a member of the National School-to-Work Advisory Board during the 1990s and as a member of the presidential advisory panel for the Association of Governing Boards (AGB). She also has held the position of Chair of the Board of Campus Compact, chair of the subcommittee on College Drinking of the Advisory Council of the National Institute on Alcohol Abuse and Alcoholism (National Institute of Health), and has served as a trustee and chair of the Trustees Academic Affairs Committee of Wilmington College in Wilmington, Ohio from 1998-2005. She was chair of the Greater Expectations Panel, a group developed by AAC&U as a multi-year initiative to define the aims of a 21st century undergraduate education and to identify strategies for accomplishing these aims. She also served as a member of the board of the American Association of Higher Education (AAHE). In Minnesota, she is a member of the Minnesota Campus Compact Board, a Director of the Merchants Bank Financial Group and serves on the boards of the Winona County Historical Society, the Great River Shakespeare Festival, and the Seven Rivers Alliance. She is the author of 35 papers and book chapters on issues in higher education, including civic responsibility, higher education and the public good, science and mathematics education and organizational change. Dr. Ramaley received her bachelors degree from Swarthmore College in 1963 and conducted her graduate studies at the University of California, Los Angeles, where she earned a doctorate in 1966. She served for two years as a post-doctorate fellow at Indiana University. In 1978-1979, she was an American Council on Education Fellow at the University of Nebraska Medical Center at Omaha, where she then held the post of Associate Dean for Research and Development. The next year, she joined the University of Nebraska’s central administration as assistant vice president for academic affairs. In 1982, Ramaley became the chief academic officer at the State University of New York at Albany. She also served as executive vice president for academic affairs for two years and as acting president for one semester at SUNY-Albany. 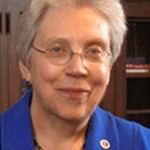 Ramaley was the executive vice chancellor at the University of Kansas-Lawrence from 1987 to 1990. Dr. Ramaley has two sons, Alan and Andrew, a daughter-in-law Ziba, four grandsons, Adam, Zachary, Nathaniel and Matthew, and two granddaughters, Zarintaj (Sarah) and Allison.